My personal recovery experience has had its share of both success and failure. Admittedly, there have been moments where I reveled in the triumph of achievements big and small, shouting from the rooftops to anyone who would listen that I was making progress, that I was getting better! And, likewise, there have been quieter, more private moments where I let my guard down and grief, frustration, or disappointment snuck in and weakened my resolve. Most days I’m able to embrace both strengths and vulnerabilities alike and I can appreciate that balance as an unavoidable part of my recovery progress. It’s not easy and often it asks much more of a person than simply time and patience. That said, I believe there has been another key component critical to my rehabilitation. 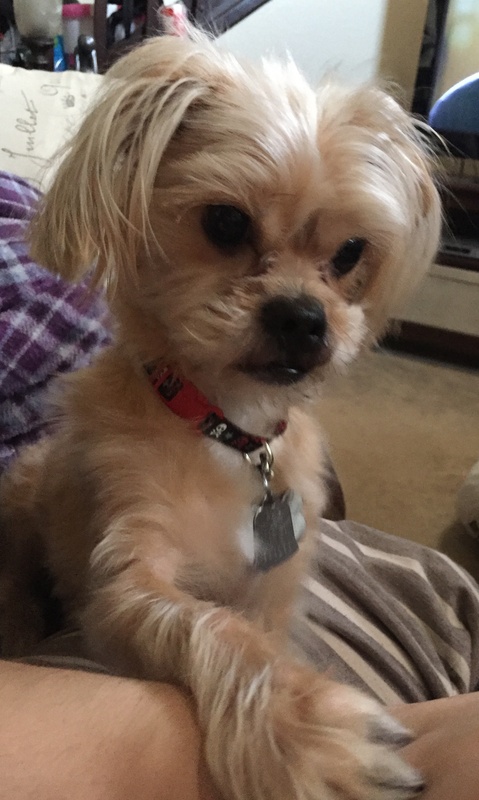 He’s the silently supportive witness to my every day wins and losses – my constant companion through the good, the bad, and the ugly – and his loving adoration never wavers: my spirited little Yorkie / Shih Tzu, Dolce. This little bundle of raw energy and unique personality came into my life at the very moment that I needed him most. After months in the hospital and rehab, my independence was slow to resurface. Even after it became clear that I would not actually need the 24/7 care the doctors had initially indicated, I was still in a somewhat fragile and dependent state. Although I had re-learned how to perform everyday tasks, I still had trouble making decisions or initiating daily functions on my own. I literally did not know what to do with myself. I ate when food was provided. I showered when I was told. I went to bed when it was “bedtime.” I was on auto-pilot but lacked the extra functionality to assert any free thought into what I was doing. Eventually, however, the fierce independence that had been so much a part of my pre-illness personality began to slowly emerge. I went back to work and one year after I first began noticing the symptoms of autoimmune encephalitis, I was finally well enough to take the next significant step in my recovery: moving out of the careful supervision of caregivers and into my own place once again. I had spent little-to-no-time by myself for an entire year and living on my own took a little getting used to, even as I valued the solitude that allowed me to evaluate and eventually come to terms with my latest circumstances. A couple of months later, in perhaps the most significant assertion of my newfound independence at the time, I decided it was time to get another dog. 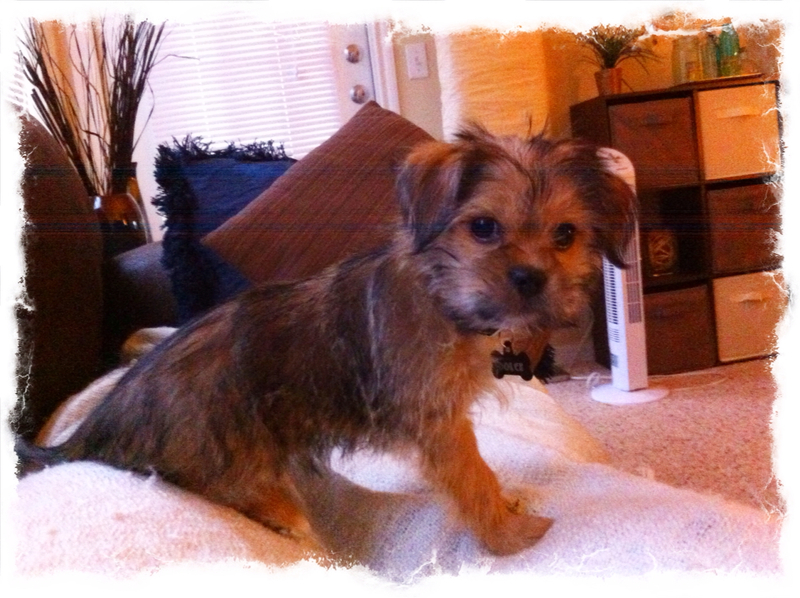 When I brought Dolce home, he weighed all of three pounds. He cried the whole hour-long trip home and I wondered if I had made a huge mistake. Was I really up to the task of caring for another living thing when I could barely take care of myself? Was I just adding undue anxiety to an already fragile psyche? I pulled the car over halfway home and picked him up gingerly from the crate I’d settled him in next to me. 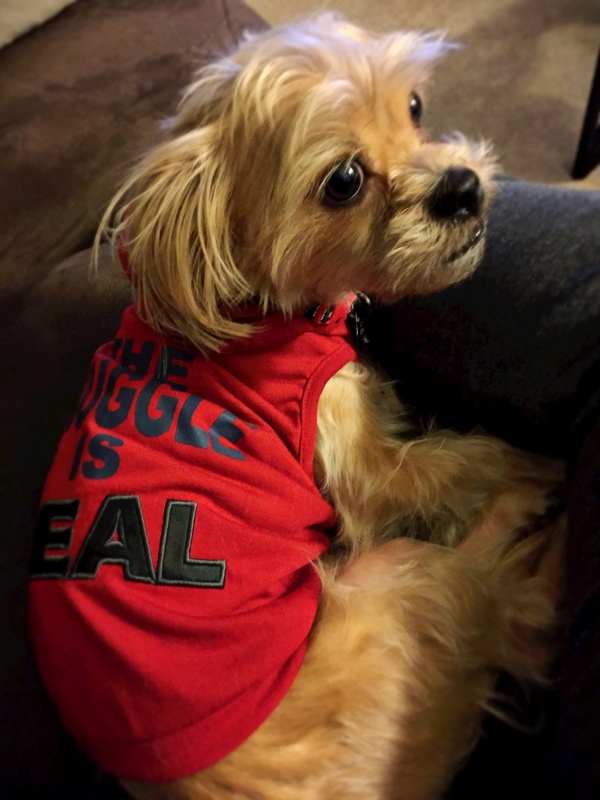 He was scared and shaking but soon curled right up in my arms and I thought, “I totally ‘get it,’ buddy.” When I looked into his sweet brown eyes, I realized he had already found a place in my heart. It occurred to me then that he needed me as much as I needed him. 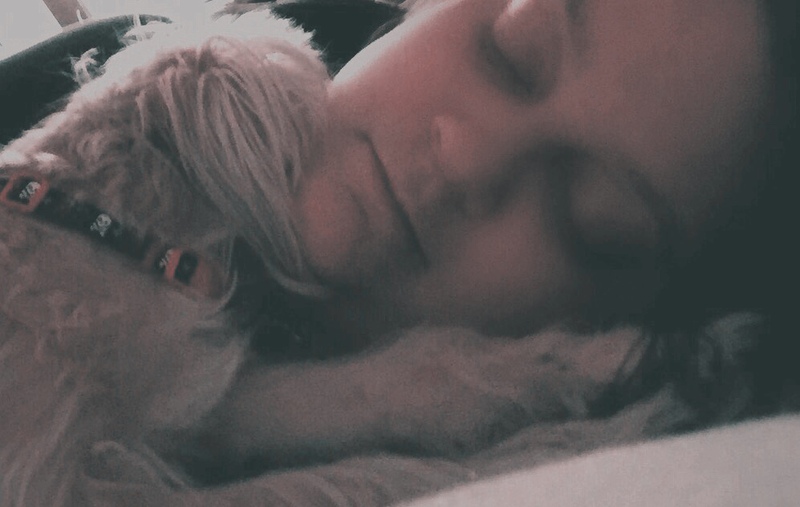 I know many pet owners are fond of the saying, “Who rescued who?” Ugh, I always thought it was so cheesy; I refused to be one of those people…until, it sneaked up on me and before I even realized it, Dolce HAD saved me. He rescued me from myself and brought me back to the land of the living in ways other forms of traditional therapy had not. Suddenly I had a sense of purpose again. Instead of dwelling on the things I had lost and the obstacles I had yet to overcome, I was focused on the well-being of someone else. Training a new puppy kept my mind preoccupied, a welcome distraction from the typical frenzied racing of an inflamed brain. I spent hours teaching him to ring a “potty bell’ when he needed to go out… until the day we (probably both) realized that it was in fact, me, who was bell-trained…and I spent the following training sessions teaching him to only ring it when appropriate (i.e. NOT every 5 minutes when he only wanted to go outside to play). He became my constant companion. We looked after each other. We took walks daily, and as he grew, so too did my physical stamina. When I was sad, he snuggled up and licked the tears from my face. When I talked to him he cocked his head to the side in that adorable puppy manner, posing a silent question. When I got excited, I was rewarded with a matching goofy grin and wagging tail. He curled up to nap on top of me when I needed to rest and seemed to sense when his playful antics were needed to pull me out of a mood. On the most difficult days, when my spirit felt especially broken, I would take him to an expanse of open grass within my complex and remove his leash to watch him run in frantic, happy circles. Seeing the pure joy radiate from him, from fluffy head to flapping tail, set my mind at ease and soothed my soul. Since then, Dolce has become a harmonizing force in my day-to-day life.There are few loads that cannot be at least somewhat lightened by spending a few moments petting him or playing fetch. When a siren goes by and he can’t help but mimic the soulful sound perfectly, I can’t help but laugh. And even when I’m utterly exhausted, when he brings a ball to me and “pretends” I’m trying to take it away by shoving it into my hand and growling, I find myself re-energized long enough to indulge him for just a bit. Being a huge fan of your writing, I wonder how I could have missed reading this or maybe I didn’t but just don’t remember anymore, which is something that happens more and more now, unfortunately. This is a great piece on Dolce, starting with the title, alluding to the expression, The Struggle is real. The illness, anti-NMDA somewhat reminds me of one of those multifaceted mirror balls, but not as pretty of course, but multi-faceted and ever-changing as it turns. I love how you focus and reflect on a particularly important facet in your life, your struggle and here in your recovery. You have come a long way Erica! Erica—this is a beautifully written testimony! Isn’t it wonderful that sometimes….things work so well!! My spouse got a puppy for me. Tristan is my lifesaver. He does nothing but love me. He is mire snuggly w me then my ither dog. It is like he knows. My other dog will just look at me but Tristan will get up on me and snuggle away. I have tears in my eyes. I too was discharged from hospital with autoimmune encephalitis and I can’t help but want a companion to help me focus on something other than the condition I have. I want loyalty, love and little moments to share with a dog. I would definitely recommend it- but you have to do what feels right for you of course! The companionship has definitely been a blessing for me.